I'm still catching up on movies that are on my list to be watched. 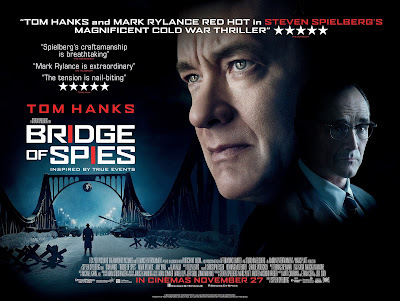 Bridge of Spies made it's way to the top so I gave it a shot. It's a cold war drama that actually turned out to be pretty good. It's a Spielberg movie starring Tom Hanks, so you basically know what you're getting in for before you even start. But it's a cool period piece that looks at the early days of the Cold War. It starts as a courtroom drama but turns into a movie about negotiation between world powers during the Cold War. I feel like I learned more about the time and place thanks to this movie. It was entertaining enough and held my attention throughout. I can recommend it as a movie you should probably see once if the premise sounds interesting to you. But it's not going to be one I come back to over and over again.